We’ve come a long way from the days when a reclining seat/bed was a big deal for first-class passengers. In 2015 — assuming you’ve got the greenbacks to ante — the skies are your oyster, oysters are your appetizer and Givenchy is your pajama-maker. What you’ll find on this list? Asian airlines. Lots of ’em. The sultan states aren’t hurting for expensive taste. What you won’t see? U.S. carriers. Who needs first class when people will pay premiums just to deboard the plane first? Below: five of the most ridiculous, opulent and shamefully over-the-top first-class amenities your money can buy. It’s a (very fancy) house in the sky. Etihad’s The Residence comes with a double bed, leather sofa, 32-inch flat-screen, wifi, and, of course, your own private chef. 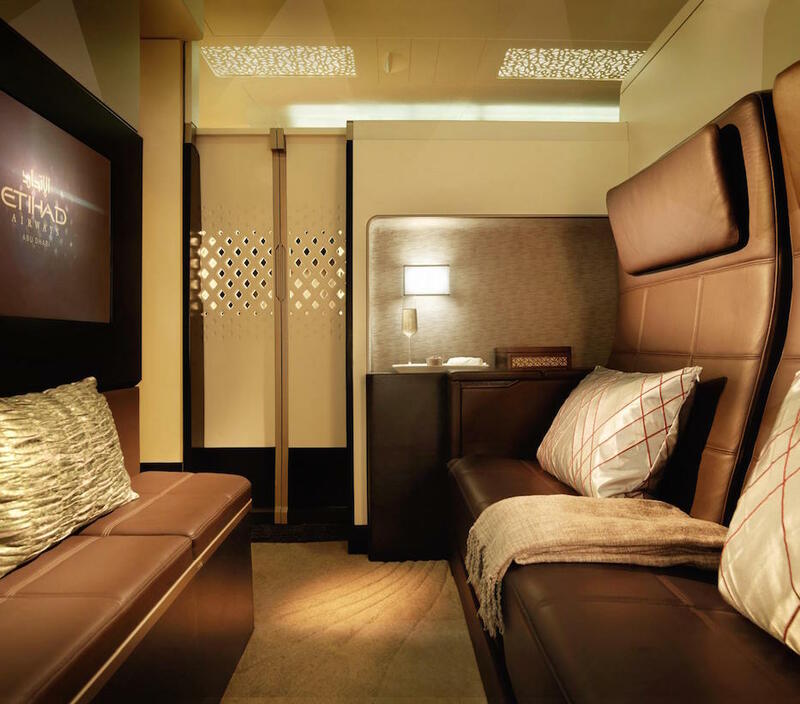 Undoubtedly spurred on by rival Etihad, Emirates recently unveiled plans to upgrade its existing first-class suites. Unlike Singapore and Etihad’s suite beds, Emirates’ are converted from seats — bummer. But they try to make up for it with the walnut-and-marble A380 Shower Spa, private cabins and Bvlgari amenity kits. 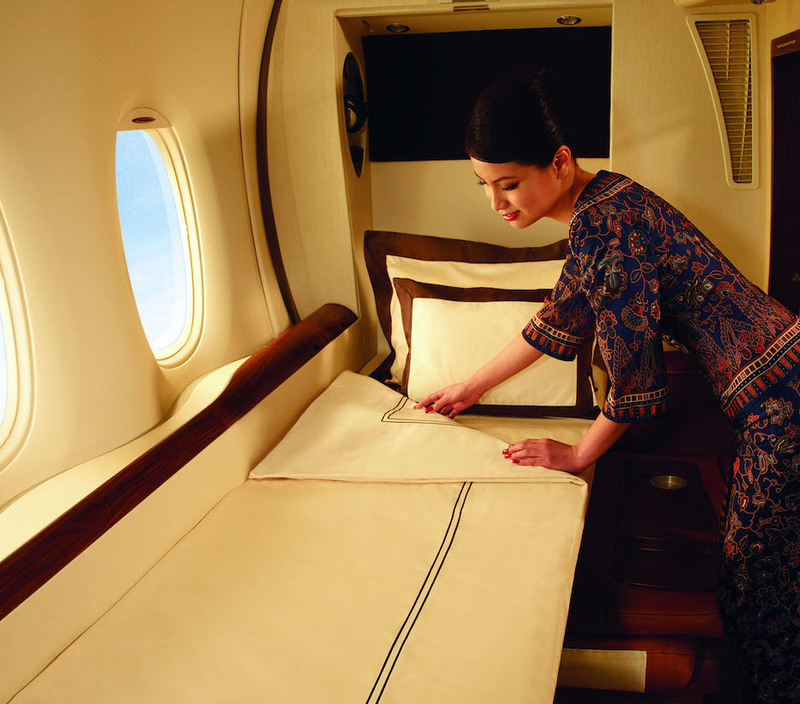 Available on the airline’s A380s, Singapore’s “Suite Class” offer a full bed, hand-stitched seats designed by Poltrona Frau, your choice of Champagne (Dom or Krug) and Givenchy linens and pajamas — and everything fits together perfectly, since the suites were designed by yacht designer Jean-Jacques Coste. Korean carrier Asiana offers a “two sliding-door suite“: less private than Etihad but more private than your typical first-class cabin. Also on deck: 32-inch TVs, a full flat bed and a seat for a friend. The seats themselves aren’t particularly over the top in Qantas’s premium cabins — but the Australian airline did score a win with its Samsung Gear VR headsets, available in the first-class lounge in Sydney and Melbourne. A three-month trial on selected A380 routes (including L.A. to Sydney) ended in mid-June, but look for them to make a return — especially as the airline is partnering with regional Australian tourism boards to create 3-D videos introducing its (richest) flyers to destinations across the country.